Fuentes-Bazan, S, Mansion, G. & Borsch, T. 2012. Towards a species level tree of the globally diverse genus Chenopodium (Chenopodiaceae). Molecular Phylogenetics and Evolution 62(1): 359–374. doi: 10.1016/j.ympev.2011.10.006 Reference page. USDA, ARS, Germplasm Resources Information Network. 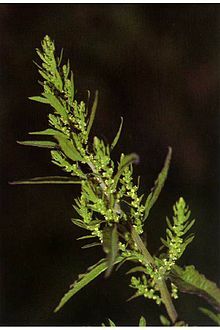 Dysphanieae in the Germplasm Resources Information Network (GRIN), U.S. Department of Agriculture Agricultural Research Service. This page was last edited on 21 November 2018, at 13:52.